Life, Doctor Who & Combom: Mad Norwegian announcements: "Space Helmet for a Cow", "Chicks Dig Gaming"
Mad Norwegian announcements: "Space Helmet for a Cow", "Chicks Dig Gaming"
But there are two new Mad Norwegian books worth mentioning here in the meantime. The DW-focused one is Paul Kirkley's new book "Space Helmet for a Cow". Here's its press release. 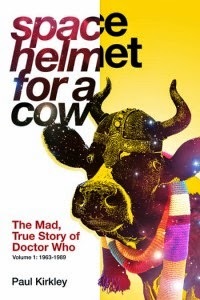 "Mad Norwegian Press is proud to announce the forthcoming release of Space Helmet for a Cow, a grand opus that provides a sweeping, wry and warm look at the behind-the-scenes story of Doctor Who – not just the greatest TV show ever made, but frequently the most insane TV show ever made. Which other program, for example, would attempt to sink Atlantis, wage inter-planetary war and crash Concorde – all in BBC Television Centre, on a budget that would barely cover a sitcom? This book also answers the burning questions few have dared tackle before. Questions like: How does a talking cabbage get an Equity card? What would have been in William Hartnell’s Glastonbury set? And if you meet a Yeti coming out of a loo in Tooting Bec, how long should you give it? Space Helmet for a Cow will be published on December 9, 2014, with a retail price (print version) of $14.95. The book will also be available as an ebook on Kindle, Nook and iBooks on the day of release. Volume 2 of Space Helmet for a Cow, covering the behind-the-scenes story of Doctor Who from 1990 to the end of Matt Smith’s tenure, will see release in 2015." The other new Mad Norwegian book is the latest in the "Chicks Dig" series, "Chicks Dig Gaming"; here's that press release. "Mad Norwegian Press is proud to announce the forthcoming publication of Chicks Dig Gaming, the newest installment in its Hugo Award-winning range of essay collections on women and various kinds of fandom. In this book, editors Jennifer Brozek (Apocalypse Ink Productions), Robert Smith? (Who is the Doctor?) and Lars Pearson (editor-in-chief, the Chicks Dig series) bring together essays by nearly three dozen female writers to celebrate the gaming medium and its creators, and to examine the characters and series that they love. Catherynne M. Valente (The Girl Who Circumnavigated Fairyland, Indistinguishable from Magic) examines Super Mario Bros. through the lens of Samsara, the Wheel of Birth and Rebirth; Seanan McGuire (the October Daye series) details how gaming taught her math; G. Willow Wilson (Alif the Unseen) comes to terms with World of Warcraft; and Rosemary Jones (Forgotten Realms) celebrates world traveler Nellie Bly and the board game she inspired. Other contributors include Emily Care Boss (Gaming as Women), Jen J. Dixon (The Walking Eye), Racheline Maltese (The Book of Harry Potter Trifles), Mary Anne Mohanraj (Bodies in Motion), L.M. Myles (Chicks Unravel Time), Jody Lynn Nye (the MythAdventures series), and E. Lily Yu (“The Cartographer Wasps and the Anarchist Bees”). Also featured: exclusive interviews with Paizo CEO Lisa Stevens and Dragonlance author Margaret Weis. Chicks Dig Gaming will be published on November 11, 2014, with a retail price (print version) of $14.95. The book will also be available as an ebook on Kindle, Nook and iBooks on the day of release." It also features yours truly, for what that's worth (I penned an enthusiastic description of wargaming, the Avalon Hill kind rather than the painted miniatures sort). Do consider giving it a look.